What was on the mind and social media feeds of our favorite celebrity moms? We can’t get over how flawless pregnant Blake Lively looks and luckily she has been sharing plenty of baby bump pics on social media. JWoww and Snooki share an adorable snapshot of their two babies enjoying a sleepy play date, while Kim Kardashian shares a snapshot of North at the pumpkin patch… wearing leather pants, of course. Reese Witherspoon and Kate Hudson round out our list of the most buzzworthy celebrity moms of the week. Blake Lively has had fun dressing her new pregnancy curves in stylish clothes and, lucky for us, many of her pieces she also features on her lifestyle website, Preserve. She shared the above photo as she shows off her baby bump in a fitted black skirt paired with a printed coat and silver-studded heels. Lively also shared this picture from the Golden Heart Awards event, in which she layered a camel-colored coat over her sparkly dress. The Gossip Girl alum, who is expecting her first child with husband Ryan Reynolds, is excited to be a first-time mom and reportedly already has a few baby names picked out. 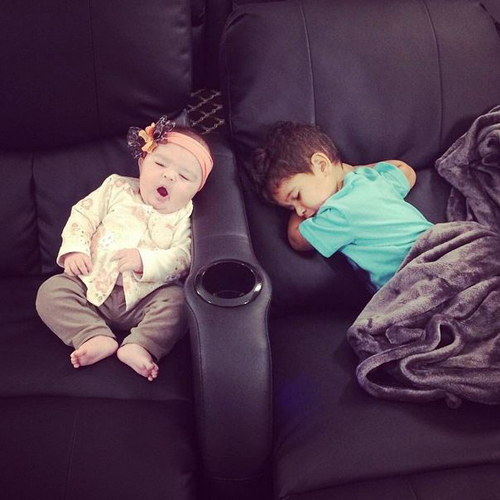 “My daughter Meilani and @snooki’s son had a movie date and you’ll never guess what happened… ” JWoww tweeted, sharing the photo above of her 3-month-old daughter who was yawning next to a sleepy 2-year-old Lorenzo. It looks like the movie may have been a snooze fest. The Jersey Shore alums have had fun bonding over motherhood while they film their reality show, Snooki & JWoww. Snooki welcomed a daughter named Giovanna in September, but has yet to share a picture of her newborn baby. Kim Kardashian posted this picture of her 1-year-old daughter North West as she had fun at the pumpkin patch. Most kids wear jeans and a T-shirt to the pumpkin patch; this celebrity tot was dressed to the nines in black leather pants, a blue cape with gold fringe and a blue bandanna. “Kisses,” Kim captioned the photo. She also shared a back view of North, who is wearing custom Vans slip-on shoes with North and West written on the back of the heel. You know, in case anyone needs reminding who she is. Hot mamas. Reese Witherspoon shared this selfie pic as she poses with Kate Hudson at the American Cinematheque Awards, which was an event honoring Matthew McConaughey. Witherspoon starred with McConaughey in Mud, while Hudson has starred with him How to Lose a Guy in 10 Days and Fool’s Gold. Not only is Witherspoon stylish, but it appears that Witherspoon, who has kids Ava, Deacon and Tennessee, is also pretty good in the kitchen. Can you steal a baby name? Mila and Ashton reportedly did!